The 4.1.4’s API is now considered stable and except for minor corrections should not be modified anymore. 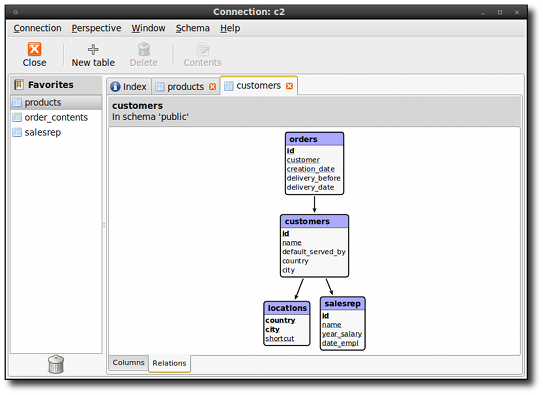 a re-write of the browser tool usefull to analyse the structure of a database and run some statements; this a a kind of merge with the one which existed in Libgnomedb and Mergeant but with a much improved user interface. This is now all in the master branch in git.gnome.org, works (except for some DnD) on Windows and MacOSX. 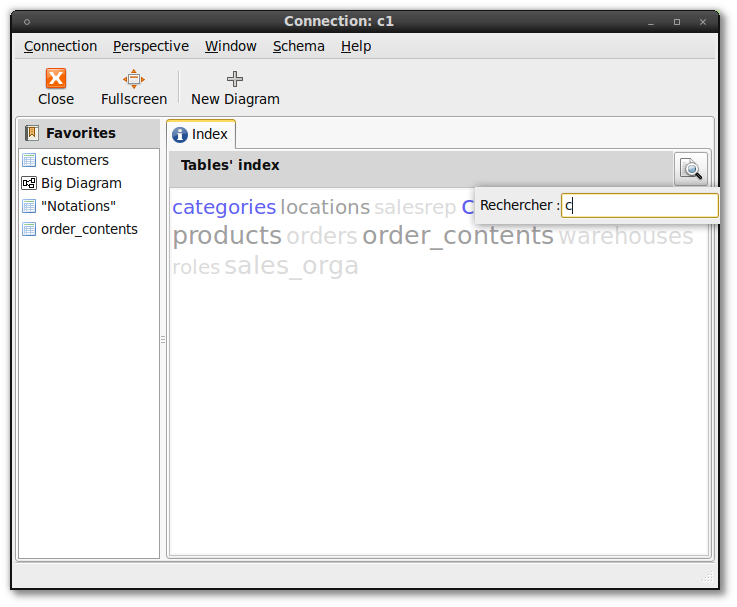 Here are some screenshots of the new browser, taken using a PostgreSQL database. One can open several connections at the same time in the browser, and for each connection, several windows can be opened. Each window displays a “perspective” (similar to Eclipse’s perspectives), and currently the schema browser perspective is implemented, which is shown below, more will come later (statements execution, reports, etc). 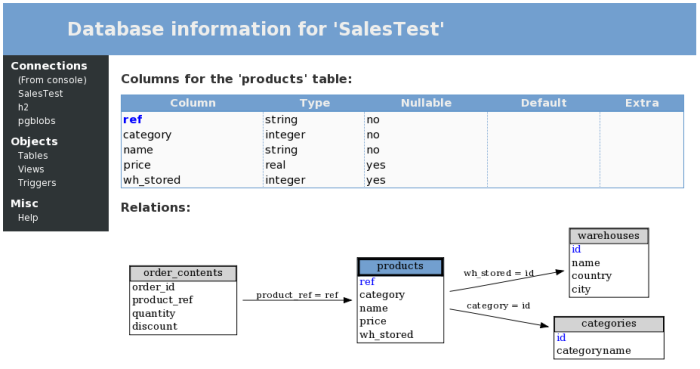 The shot above cleary shows that the “customers” table references the “locations” and “salesrep” tables and is itself referenced by the “orders” table. 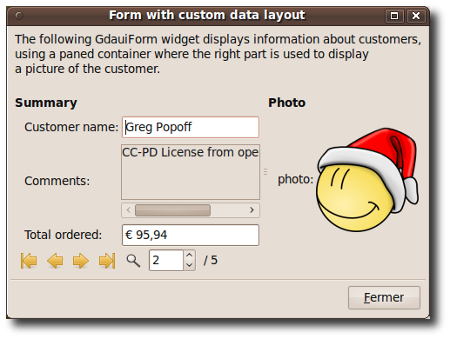 The canvas is drawn using GooCanvas and can be exported to PNG and SVG or printed. 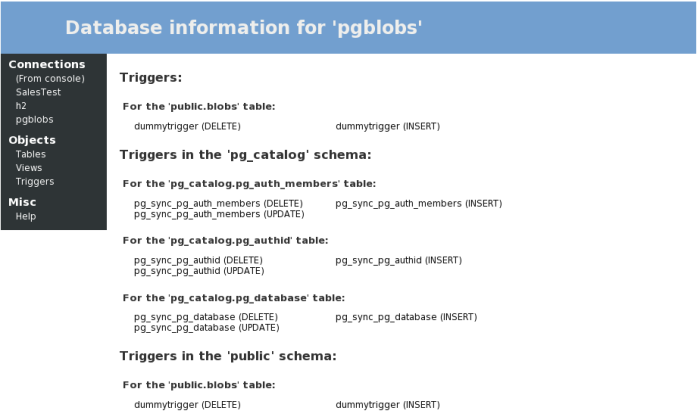 Following my post on the new embedded web server feature of Libgda’s SQL console, I have spent some time on improving the user experience (the web server is optionnaly enabled and serves pages containing information about the current opened connections). a “terminal emulator” page has been added, which behaves almost like a normal terminal emulator and where commands can be entered. 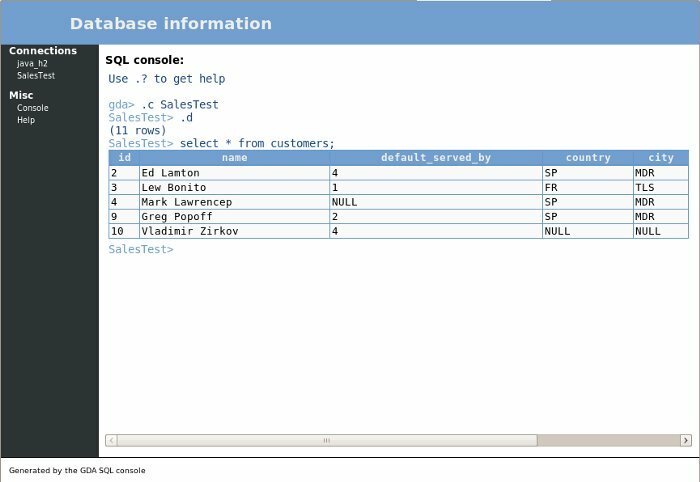 Through it, one can execute SQL commands and internal commands (commands specific to Libgda’s console for various tasks such as opening and closing connections). 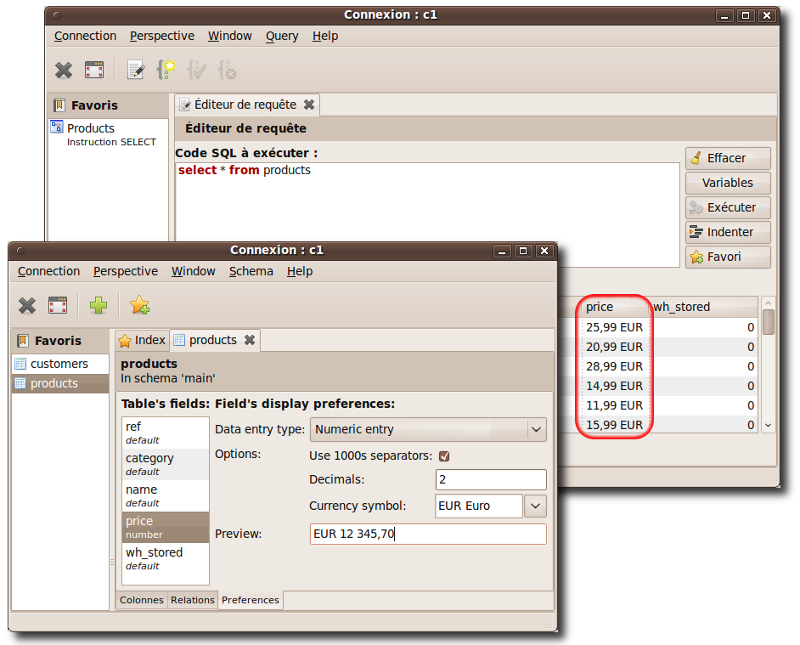 The following screenshot shows a sample session in the terminal emulator; the “.c SalesTest” command requires that the “SalesTest” connection be used, the “.d” command lists all the tables and views of the connection. I’ve been using SQL consoles for years. 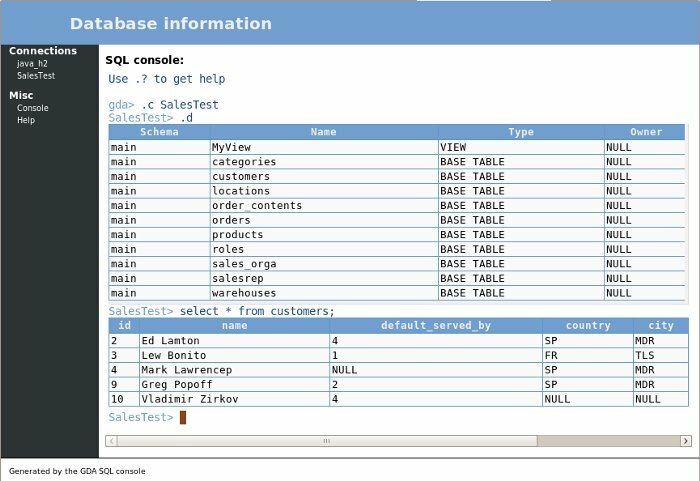 Each database has its own SQL console: psql for PostgreSQL, mysql for MySQL, sqlite3 for SQLite3, sqlplus for Oracle,… When one needs information about database objects such as for example the tables, their columns and relations with other tables, one has to remember the syntax to use depending on th SQL console (for example to list the tables: \dt for PostgreSQL, show tables; for MySQL, select name from sqlite_master where type=’table’; for SQLite3). This can be quite frustrating when using several databases and consoles, and is the reason I decided to write yet another SQL console, part of Libgda which overcomes all these little difficulties. 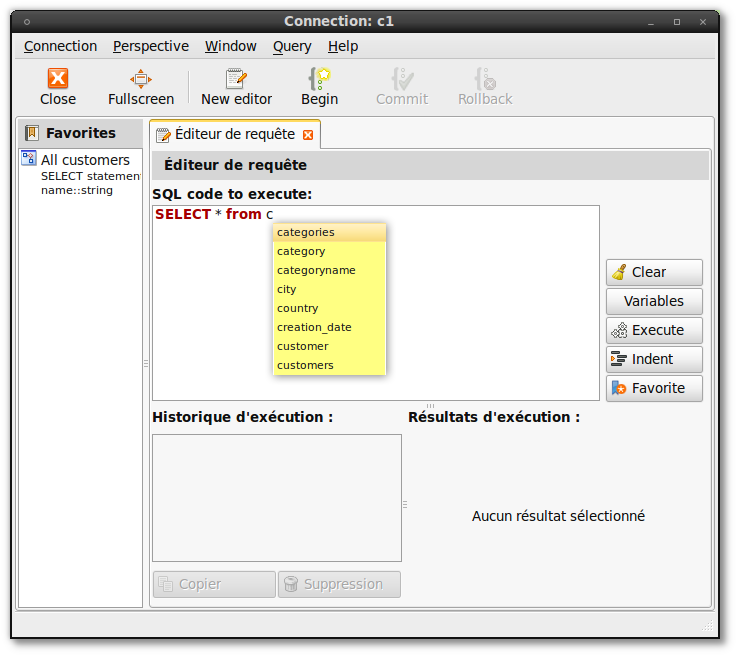 The syntax (and displayed information) is the same for every database Libgda can connect to. There is at the moment no security around the web server (anyone can connect) but this will be added. Been a long time without any post… here are some fresh news about Libgda. I’ve been working lately on a JDBC (JAVA’s own mostly standardized way to access a database) wrapper for Libgda; that code has just been committed to subversion. 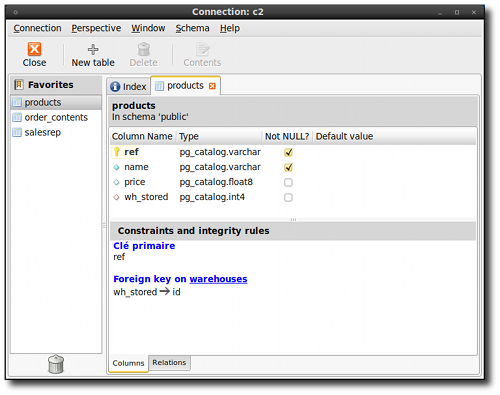 Even though it’s still not finished, it is already quite useable: you can write a C or C++ application which accesses data through JDBC. 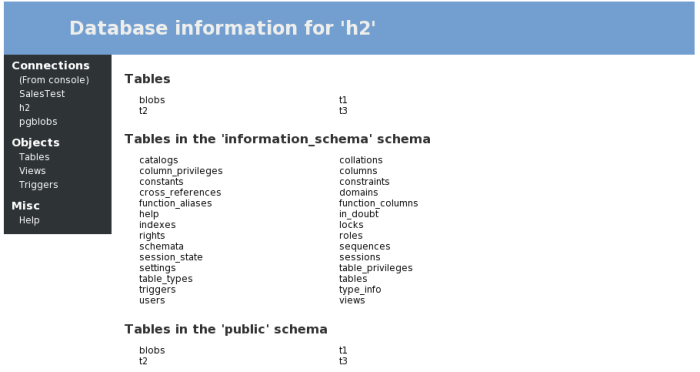 I’ve been testing it with the H2 and HSQLDB database engines (which are written entirely in JAVA, HSQLDB being the ‘default’ database engine used by OOo’s Base component). Here is how it works: the JDBC wrapper (which is a shared library like for other Libgda’s databases’ wrappers) loads a Java Virtual Machine (JVM, which is also a shared library) which itself loads the JDBC drivers, opens connections, run queries,… The communication between the C and JAVA parts is done through the Java Native Interface (JNI). I’m testing this on Linux (both 32 and 64 bits) and Windows XP with Sun’s JRE or JDK. Last but not least I’ve proposed a patch to the Gnumeric people to update the Libgda plugin which allows one to insert into a spreadsheet the results of a SELECT query run through Libgda. Libgda is reaching the point where its API will be declared stable, I expect the next version to be tagged “API stable” in a week or two (depending on the API feedback I get). I encourage people using Libgda to migrate to this version as it has many bug corrections (and many improved features compared to the V3). Also for the first time, I managed to create some Win32 ZIP archives (MSI files can be done on request but take more work to do because they can’t be done from Linux). These archives are with all the other Win32 Gnome’s archives at http://ftp.gnome.org/pub/GNOME/binaries/win32/. The first V4 beta of Libgda is out. It is still buggy and an unfinished work, however one can start to experiment with the new API and features. Having spent my last few weeks’ spare time working on the next version of Libgda (V4), I’ve finally merged all the changes into SVN trunk. This next version will break the API with the previous version, but it will offer an easier to understand and to use API, and several other changes (wich will enable closing of some long standing bugs). 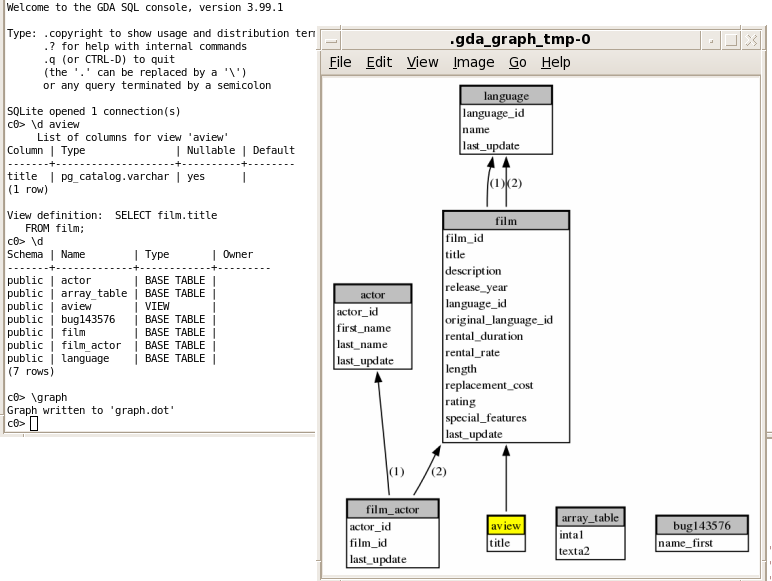 The SQL console tool has been improved to show the potential of the new version, here is a sample session which shows the new \graph command which (if the dot GraphViz command is installed) can produce a PNG or PDF file. 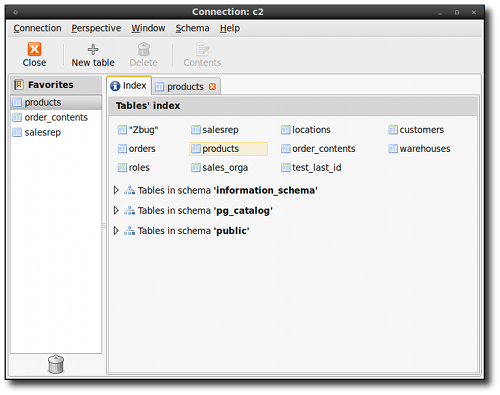 Note that the view named ‘aview’ has a dependency listed on the table ‘film’ because it uses that table (as seen from its definition).